I.E.S Rdl has been participating in the developed of Cooperation Projects since the year 1996, both as partner and promoter in a number of EU projects, not only mobility projects but also projects devoted to the productions of training materials, performing researches, developing learning methodologies, etc. It has been very active in the development of projects focus at languages, people in risk of exclusion, Roma or several technical topics. Regarding mobility, IES RdL has performed a number of Erasmus and Leonardo da Vinci projects. Performing an international project is already part of the own culture of the organization. Regarding Erasmus mobility for staff and students, IES RdL is always open to new collaborations as sending and receiving organization. We are particularly interested in partners working in areas related to International Business and Administrative and Financial Management across Europe. The only limit is the level of the cost of the mobility for the students, coming in general from families with a low or medium standard of life. The IES RDL has a wide range of partners from different countries of the EU created through the number of different projects performed. Preference of students, as long as the host organization has arranged the essential requirements, the training and the programme. Countries where the students learn a language that makes them easier to access the labour market. Contact with previous host partners, that facilitate the performance of new mobility projects. Two vocational training courses tertiary level is suitable to use the Erasmus Programme “Admininistration and Finance” and “Internaional Trade”. Promote and encourage the use of ICT in order to expand the professional competences of people participating in mobility programmes. Improve the linguistic skills of the participants, whether English or another language, depending on the local language of the host country or the language used for the particular programme. Contribute to the increasing of the intercultural competencies of the participants. In general, through the participation of such programs, the IES RdL aims to contribute to professionals in these target sectors acquire and/or improve their knowledge, skills and attitudes on a global context, via global mobility, encouraging their personal and professional development. Improving their communication skills and social. The empowerment of their employability in the local labour market, nationally and internationally. The knowledge of the industry at the international level. The transfer of best practices of the destination country. Increasing competitiveness of the companies in a particular industry. RAMME The IESRdL has participated in cooperation in a number of projects related to training and education within the Lifelong Learning Programmes, as well as in other projects, as Interreg or calls in previous years. In order to implement such projects, the International Projects Coordinator, in collaboration with other teachers and the responsibility for the management of the school, will carry out all of the steps necessary for the development of the project (previous preparation, submission, development and justification). The first phase of the submission of these types of projects, refers basically to the research of the real needs of the organization, always having into account the European priorities at the moment of project submission. Once the project is approved, the coordinator, in collaboration with other school teachers (always related to the area/topic of the project) will start to work on the development and implementation of all proposed activities. Last but not least, the justification phase will be carried out, according to the proposal of the European or National Agency. Related to Erasmus projects, IES RdL is interested in participating in the future in cooperation projects related to mobility for staff and students, both as receiving and sending organization. It is foreseeing also the submission of applications for Multilateral Projects in areas related to International Commerce and to vocational training or education in general. Increasing attainment levels to provide the graduates and researchers Europe needs. From the current and complicated situation for the unemployment following the economic crisis, especially for Spanish youth, there is a real need for training and better adaptation to new markets. For this purpose, IES RdL aims to provide new opportunities for their students through this mobility projects. They can improve their future expectations and provide a career, also promoting the EU as training and research destiny. 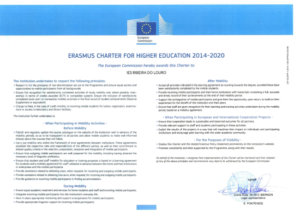 Improving the quality and relevance of higher education in the EU. The development of these projects will promote the improvement of this type of education, as it will give an added value beyond the classroom, basically through mobility projects. The development of these projects will promote the improvement of this type of education, as it will give an added value beyond the classroom, basically through mobility projects. Strengthening quality through mobility and cross-border co-operation. Cooperation with other EU countries will contribute to improving the quality of education in the school. The mobility of staff will be key in this task by means of knowing how other EU organizations deal with the main challenges and goals of the education. Making the knowledge triangle work: Linking higher education, research and business will contribute to achieving excellence and regional development. Cooperation projects will contribute to foster research activities, particularly Multilateral Project, but it must be always in contact with the working world in order to be sure that the research is focused to the real needs of the society. Also, mobility fosters the relationship between the education and training organizations with the companies, contributing to improve the quality and visibility of the education. Improving governance and funding. 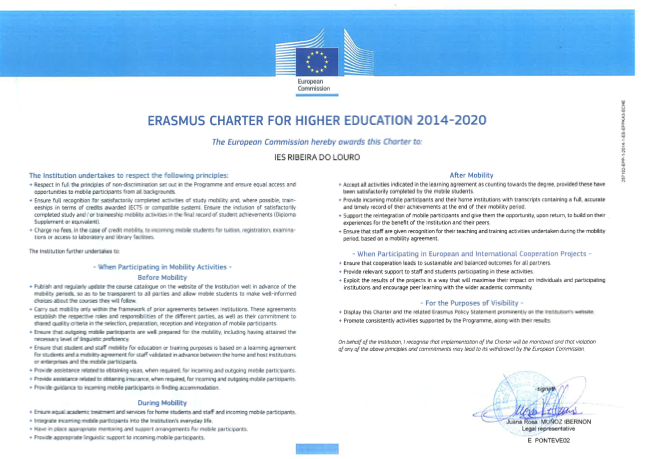 The development of Erasmus projects will put in contact our organization with organizations from other European geographical and cultural areas, bringing to us the experience of these organizations in governances and funding, where our country is not at all a leading country in Europe, contributing them to our improvement in both fields.